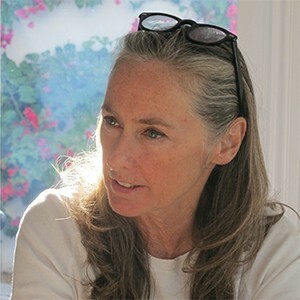 Mary Sweeney is an award-winning feature film producer, director, writer, and editor. She collaborated with David Lynch as his film producer, writer and editor beginning in 1985 with Blue Velvet, and continuing through his 2006 film Inland Empire. She edited Twin Peaks Television (1990), Twin Peaks Fire Walk With Me (1992), Hotel Room, HBO, (1993), Lost Highway (1996), The Straight Story (2000) and Mulholland Drive (2001.) She was awarded a British Academy Award for Best Editing in 2001 for Mulholland Drive. Sweeney wrote the screenplay for The Straight Story for which Richard Farnsworth received an Academy Award nomination. Her producing credits include Lost Highway, The Straight Story, Mulholland Drive and Inland Empire (2006), directed by Lynch, and Baraboo, (2009) her directorial debut based on her original screenplay. She is Consulting Producer and Writer on The Romanoffs, (2018,) Matthew Weiner’s new series for Amazon. She is the Chair of the Board of Directors of Film Independent, the non-profit Arts organization that produces the Independent Spirit Awards, the Los Angeles Film Festival, and the Film Independent Series at LACMA. She is a founding member and Vice President of the Board of Desert X, a site specific art exhibition throughout the Coachella Valley, inaugurated in 2017. DX 2019 will open on February 9, 2019. As an AFS film expert and a Fulbright Specialist Sweeney has traveled to Jordan, Kazakhstan, Laos, Myanmar, Cuba and Egypt to work with filmmakers in those countries.